The CyFlow Space is a high-performance multi-laser flow cytometer, which offers the most flexible, simple and reliable features for routine and research work. It is a compact multi-colour instrument for the analysis of individual cells and microscopic particles in suspension. 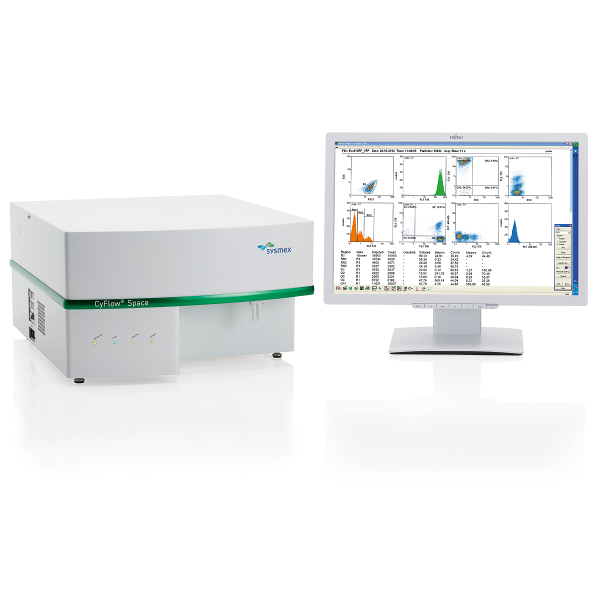 The advanced flow cytometry technology of the CyFlow Space covers a wide range of different applications. Fluorescence excitation by one to five light sources covering a range from ultra-violet to red excitation lines. o Analysis of up to 13 fluorescence parameters and three physical light scattering parameters from near UV to infra-red light. Analysis of cell and particle concentration by True Volumetric Absolute Counting (TVAC). Cell sorting by an optional cell and particle sorter. Fixed standard configurations and flexible customised configurations tailored to the user´s requirement. Walk-away automation by sample auto-loading from 96- and 384-well plates. The Windows™-based FloMax® software includes multiple online gating, logical gates, and colour gating. N-colour online and offline software compensation is another standard feature of the FloMax® software. Data may be acquired with compensation or as uncompensated raw data. Either way, compensation can be done, undone, or changed after analysis on stored data. User-selectable statistics are calculated on subset populations identified by regions that are created by the user with easy-to-use drawing tools, and combined using simple, logical formulas. Other sophisticated features include cell cycle analysis and peak analysis. Custom reports are quickly and easily generated from the acquired data using the integrated, macro-driven interface with Microsoft™ Word and Excel. FloMax® data files are stored in FCS standard format and are therefore fully compatible with other commercial flow cytometry software. The FloMax® software is pre-installed on the Windows™ PC that is delivered as part of the CyFlow® Space systems. Three additional licences for offline copies of the FloMax® software are also included free of charge, which offers a cost-effective solution for working groups with the need for offline data analysis software.